Cut tofu into steaks, or into cubes/strips to use in tacos. In a wide shallow dish, combine all ingredients for the marinade. Lay tofu steaks side-by side on bottom of dish, flipping to coat both sides. Cover and marinate in the refrigerator for at least 1 hour, or preferably overnight, giving it a flip once or twice to ensure that it marinates evenly. Before grilling your tofu, stir together all the ingredient for the avocado corn salsa and set aside. Heat a grill pan over medium heat and grill tofu for 2-3 minutes per side. Serve with avocado corn slaw on top. This tastes great served over a bed of rice pilaf, or in a corn tortilla with cabbage and vegan sour cream. 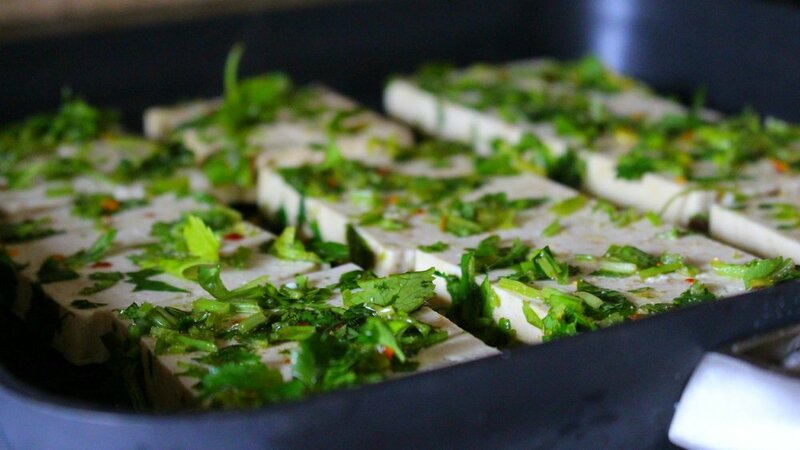 Cut tofu into steaks (if eating as-is) or into cubes or strips to use in tacos. In a wide shallow dish, combine all ingredients for the marinade. Lay tofu steaks side-by side on bottom of dish, flipping to coat both sides. Marinate for at least 1 hour, or preferably overnight, giving it a flip once or twice to ensure that it marinates evenly. Before grilling your tofu, stir together all the ingredient for the avocado corn slaw and set aside.